Leica launching new cameras at Photokina? Is Leica developing new cameras to be announced at Photokina? 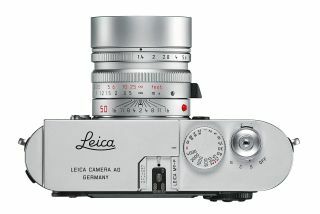 Rumours are circulating that Leica will announce two new cameras at Photokina 2012, taking place in Germany later in the year. One of the cameras is expected to carry a cheaper price tag than we have come to expect from Leica, which is a premium photography brand. The rumours come courtesy of Twitter, with one feed from DSLR Magazine suggesting that it has been told by "informed sources" that Leica is working on the new models. LeicaRumors is interpreting the tweet to mean that a new Leica M10 and a new mirrorless system are on the cards. A new compact system camera is expected to have an APS-C sized sensor (at least) and will be compatible with Leica R lenses. The CEO of Leica, Alfred Schopf, has previously talked of a new compact system camera to sit between the current M and X line-up. The Leica M9 is the world's smallest full-frame interchangeable lens camera. In a previous interview, Schopf said, "It's pretty obvious that at one point, we are going to offer something in between. But we have to look very carefully into what sensor parts we are using and what features we are offering." It is thought that the sensor would be at least APS-C sized as Leica has previously expressed it has no interest in the Micro Four Thirds format as used by Panasonic and Olympus. Photokina is a bi-annual photography trade show, which takes place in Cologne. This year, the show will be between 18th and 23rd September. It often sees many big launches from photography companies around the world, although this year we are also expecting to see big things from the upcoming CP+ trade show taking place in Japan during the first week in February. As Leica is a German company, it's perhaps more likely that it will wait until the country's own show in September to make any announcement.